Day 90: Start A Nest Egg: How To Protect Your Future Now! Putting aside money today is one of the best gifts you can give yourself. It’s impossible to guarantee a life free of bumps and bruises, but having a healthy savings account can prevent a little owwie from turning into a huge, festering wound. Starting a nest egg is not just sound financial planning, it’s also a way to show love to yourself and to re-examine your relationship with money and material things. As you look for ways to cut expenses and boost your savings, it’s likely you’ll learn a lot about what you value and what you fear. Don’t put off savings until you’re earning more money. Even putting aside as little as five dollars a week will help you become more disciplined and give you enough to handle little emergencies. As your financial situation improves, you’ll be able to increase your savings, but don’t use a lack of surplus as an excuse not to save at all. Your first priority should be an emergency fund, even before paying off debt. Financial experts will give different answers to how much is “enough” but I believe the answer is highly individual. If you are a young person who still lives at home or in the dorms, the answer is likely to be much different than a person who has children or an older person in poor health. If you don’t believe that you can find even a few dollars a week to put aside, it can be illuminating to keep a spending diary to find out where all of your money goes. Chances are good that you’ll find a couple of places where you can cut back without severely impacting the quality of your life. In fact, you might find that little things like bringing a water bottle from home instead of buying soda from a vending machine at work/school, will not only help you save money but will also improve your health and well-being. Look for ways to enrich your life without spending money and you’ll not only be in better financial shape, but you will also increase your feelings of resourcefulness and creativity. Challenge yourself to find ways to eat better for less, to socialize without spending and to make do with what you have instead of buying new. If you are genuinely living so close to the edge that you can’t spare anything to save, it might be time to look for ways to earn some extra income to give yourself that cushion. Again, this is highly individual, and it might be that your circumstances are genuinely temporary and you feel comfortable taking this risk. However, for many, it would be wise to look for ways to earn more, even on a temporary or sporadic basis to build a little nest egg. Make savings a priority by paying yourself first. Decide how much you’ll save each time you are paid and take out that money as soon as possible and put it into savings. In theory, it sounds good to save whatever is left over after you pay bills and expenses, but in practice, these things expand to take up all of the money available and you might be surprised how little is left. Similarly, you won’t miss what you never see. Look for ways to make your savings as automated as possible. Most banks will let you automatically transfer money to another account or you can talk to someone at your job about splitting your automatic deposit between your checking account and a savings account. 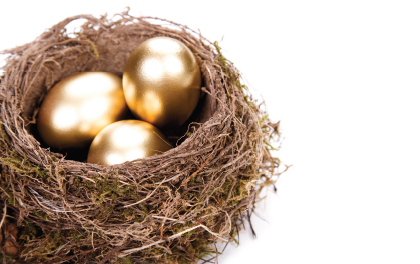 Look for quick ways to give your nest egg a little boost. This will help you stay motivated and make it feel more substantial. Perhaps you could sell things you no longer need on Craigslist or Ebay or look for a temporary second job. Saving money is a good way to take care of ourselves. As a bonus, it forces us to spend less and think more carefully about how we spend and what we consume. This can lead to a richer, more fulfilled life as we replace material things with pursuits that are ultimately more enriching. You deserve a better life. All you really need to get there is a dose of daily consistent motivation to help you keep your eye on the ball and your head in the game!